Lagos State government has validated the Human Resource for Health (HRH) Strategic Plan and Task Shifting Task Sharing (TSTS) Policy for the State which is meant to address dearth of human resources in health sector. 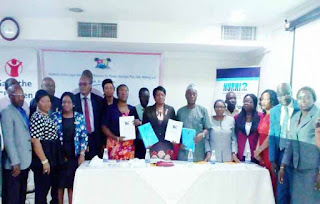 The document which is a five-year implementation framework was developed by the State in partnership with Save the Children (SCI); Nigerian Urban Reproductive Health Initiative 2 (NURHI2) and fhi360. According to him, Lagos State has recognised the central and strategic role of the health workforce in the provision of the required manpower for the delivery. The commissioner who was represented by Moyosore Adejumo, the Director of Pharmaceutical Services, said: “This supports the state in achieving its health goal aimed at the provision of quality healthcare that is equitably accessible, effective, efficient and affordable. “This goal will be achieved by developing, improving, increasing and strengthening the health workforce with the appropriate numbers, distribution, skill mix, knowledge, competence and motivation to deliver health care services with the greater level of efficiency,” he said. Idris added: “The Lagos State government has once more by the articulation of this HRH Strategic Plan 2018-2022 demonstrated its commitment and resolves to invest in the process of strengthening and improving the current health workforce and prepares the enabling environment for the future pool of health workers. “Lagos state has over the years improved available evidence for its planning and management purpose. For the development of this HRH strategic plan, the Ministry of Health working with its partners have complied comprehensive evidence on the HRH situation. A multi sectoral approach has been instituted for the development, coordination and management of HRH in Lagos,” the Lagos Ministry of Health boss said. Concerning the implementation, Idris however, assured that leadership commitment would be provided to ensure that priorities, targets, objectives and interventions are met. “These will support the achievement of health outcomes as well as other health reform initiatives by the current administration,” he said, adding that the HRH strategy plan would be reviewed periodically to ensure consistency in the delivery of its aspiration and its appropriateness to the evolving HRH realities in state. He also said that efforts would be situated to ensure the integration of planning process for health workforce with the health components alongside service delivery. “The health component of the Lagos State Development Plan will be emphasized to ensure the achievement of its targets and deliverables through a strengthened Health workforce. This HRH strategic plan is the second of its kind and will build on the achievement of the current plan to expire in 2017,” Idris said. The Commissioner further noted that that in Nigeria, Human Resource for Health shortage and inadequate skill distribution are the major determinant in the delivery of quality health care services. He also observed, the increasing population of Lagos State has reduced the health worker to patient ratio resulting in the shortage of health workers across all cadres. The Commissioner however assured that the ministry of health is dedicated to the Task Shifting Task Sharing policy for essential health services and will take suitable steps to adapt the policy for implementation with a view to achieving universal health coverage and the sustainable development goals. On his part, Adejumo further explained in an interview that with the policy, persons who are seeking for health will be better served. Giving details, he said that this is because some of those responsibilities which are appropriately shared to sub cadres of the main professional group will be better available to clients who are seeking health. “Clients would not be turned away. On the other side of the coin, those professionals would be better enabled by virtue of the fact that they will not be overwhelmed by so many patients who want to see the core professionals. “Some of those duties or responsibilities can be shared so that the doctors, nurses, pharmacists and laboratory scientists will not be overwhelmed,” she said. Dr Opeyemi Odedere, Save the Children representative, told INDEPENDENT that the five-year plan has articulated activities and generated indicators that would be monitored based on implementation strategy for the HRH policy of the State. Odedere said; “The plan demonstrates the commitment of the state in ensuring an enabling environment for the future pool of health workers in the state. This would eventually strengthen the current health work force. He added that TSTS was conceived as a result of shortages in human resources and inadequate skill distribution within the health system. Similarly, Dr. Edun Omasanjuwa, representative of NURHI 2, described the TSTS as a policy that ensures that there is enough human resource to go around; to provide the essential services that are required at the facility level in such a way that client and patients are able to access essential primary healthcare services regardless of whether the primary provider of that services is available. “If a superior officer is not available at the time of needs, the sub cadre or junior officer staff can provide that services that they have been adequately trained, monitored and certified to provide under supervision,” Omasanjuwa said. Akaoma Onyemelukwe, a lead consultant to the project, said: “Today we had to validate the HRS strategic plan which is a five year implementation plan that translates what were the findings from the situation analysis into action. “This strategic plan can only work if it is well resourced and if the investment on HRH is increased in terms of budgetary and non-budgetary allocations and funding. “This plan actually talks about eight priority areas. One of which is communications and connectivity in the HRH which is the information system for human resources and also the workforce plan which is the bane of the plan,” she explained.